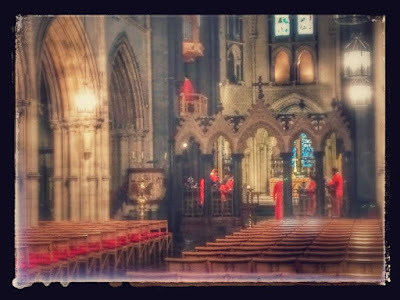 Liturgy 1.2: Field trip to Dublin churches. 9.30 a.m., Dublin city centre. How churches are shaped shapes our approach to liturgy, ritual and worship. Ask a child in Sunday school to draw a church and she will probably draw a three-day barn-style church with simple Gothic windows, and with a tower and steeple. We know all churches are not shaped like this. But if we grow up with this as a model of what a typical church should look like, how does it shape our expectations of ‘typical’ liturgy and worship in our churches. How does the surrounding community see this church? What is the first thing you see when you go into the church? Why did the designer of the church want you to see this church? What priorities are being expressed by the location, placing or visibility of the altar, pulpit, font …? What is being said by the chancel arch, the screen, the windows? Where is the presence of Christ to be found first and foremost … word or sacrament? And … would you build a church/cathedral, like this today? 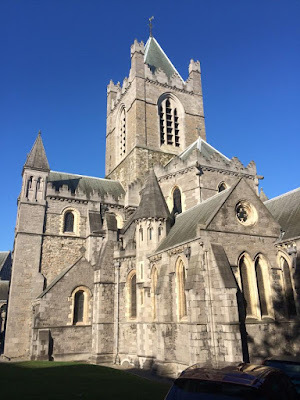 Christ Church Cathedral, in the heart of the former Viking and Anglo-Norman city of Dublin, is the diocesan cathedral of the United Dioceses of Dublin and Glendalough. 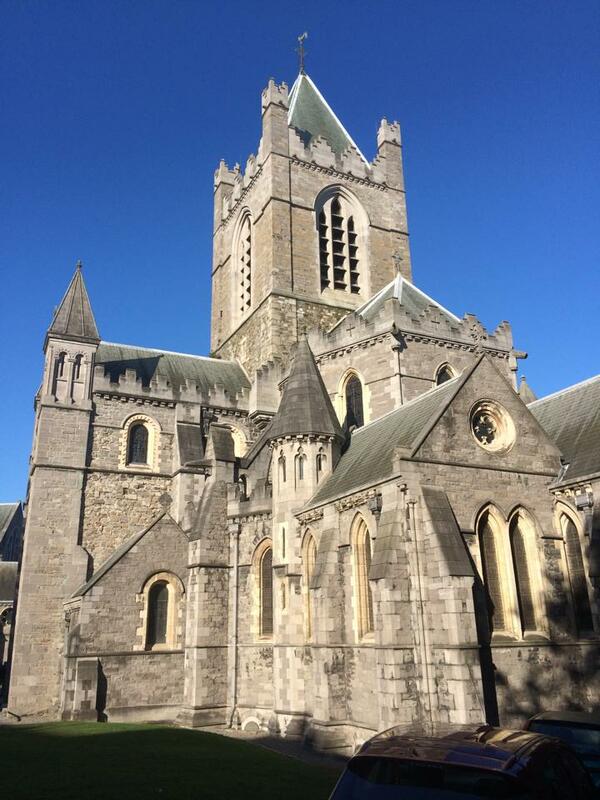 The earliest manuscript dates Christ Church Cathedral to its present location around 1030. Dúnán, the first bishop of Dublin and Sitric, Norse king of Dublin, founded the original Viking church, which was probably subject to the Archbishop of Canterbury. 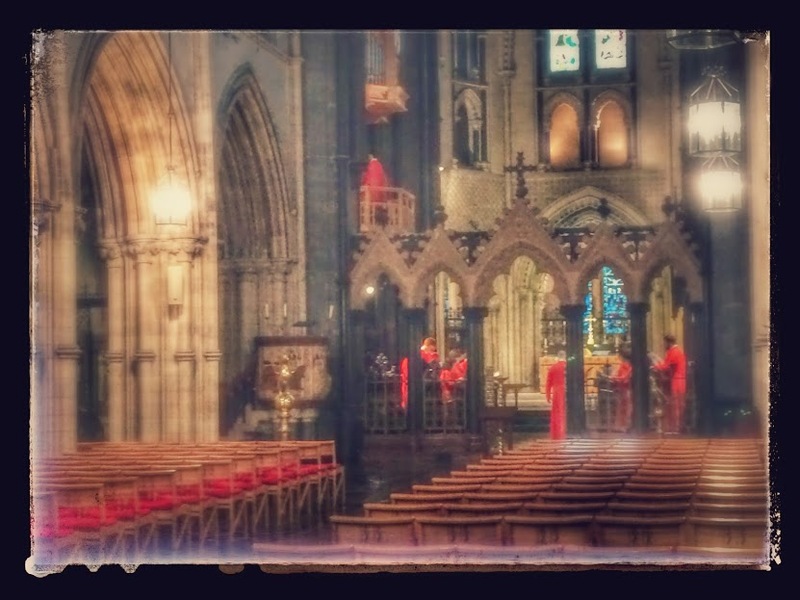 By 1152, Dublin was incorporated into the Irish Church and within a decade Archbishop Laurence O’Toole had been appointed. This future patron saint of Dublin began a reform of the cathedral’s constitution along European lines and introduced the canons regular of Saint Augustine forming a cathedral priory, which was to survive until the Reformation following the liturgical use of Sarum (Salisbury) in England. Laurence O’Toole acted directly in diplomatic negotiations between the City of Dublin and the Anglo-Normans including Strongbow (Richard de Clare) after the capture of the city in 1170. It was due largely to John Cumin, the first Anglo-Norman Archbishop of Dublin, that the Hiberno-Norse cathedral was replaced with the Romanesque and later Gothic cathedral, parts of which survive to this day. In 1395, King Richard II sat in state in the cathedral to receive homage from the kings of the four Irish provinces. In 1487 Lambert Simnel, pretender to the throne in the reign of Henry VII, was ‘crowned’ in Christ Church as Edward VI. In the 16th century, reform again came and the Augustinian priory of the Holy Trinity was dissolved and replaced with a reformed foundation of secular canons. In 1541, Robert Castle (alias Paynswick), the last prior, became the first dean of Christ Church. In 1562, the nave roof vaulting collapsed and Strongbow’s tomb was smashed. The current tomb is a contemporary replacement from Drogheda. The cathedral was in ruins and emergency rebuilding took place immediately. This temporary solution lasted until the 1870s. Since the collapse of the roof, the north nave wall has leaned out by 46 cm (18 inches). In the 16th and 17th centuries, the crypt of Christ Church was used as a market, a meeting place for business, and at one stage even a pub. The cathedral system virtually collapsed during the Cromwellian period, and Christ Church was given a new constitution in 1660. This has since been modified by the General Synod but remains the foundation for governing the cathedral. In 1689, King James attended Mass here and for a brief period Roman Catholic rites were celebrated here. A year later, returning from the Battle of the Boyne in 1690, King William III gave thanks for his victory over King James II and presented a set of gold communion plate to the cathedral. In 1742, the cathedral choir and with the choir of Saint Patrick’s Cathedral sang at the premiere of Handel’s Messiah in neighbouring Fishamble Street. The Church Temporalities Act of 1833 brought partial disendowment and impoverished what had been one of the wealthiest ecclesiastical bodies in Ireland. When Charles Lindsay, Bishop of Kildare and Dean of Christ Church, died in 1846, the Dean of Saint Patrick’s Cathedral also became the Dean of Christ Church. Not until 1884 did Christ Church have its own dean once more. Meanwhile, the disestablishment of the Church of Ireland in 1871 saw further constitutional change and financial disendowment at the cathedral. The cathedral owes much of its appearance today to the extensive Victorian restorations and renovations by George Edmund Street between 1871 and 1878. This was at the expense of a Dublin whiskey distiller, Henry Roe, who gave £230,000 (€35 million in today’s equivalent) to save the cathedral. A two-year restoration of the cathedral roof and stonework was undertaken in 1982. Kenneth Jones of Bray installed a new organ in 1984. Further work since 1997 has included the renewal of the heating and lighting systems and the restoration of the 12th century crypt. The crypt houses the Treasures of Christ Church exhibition, with communion plate, manuscripts and artefacts that illustrate 1,000 years of worship in the cathedral and nearby churches. Saint Werburgh’s Church is a Church of Ireland parish church in inner-city Dublin, close to both Christ Church Cathedral and Dublin Castle. This is one of the three churches in the cathedral group of parishes (the other two are All Saints’ Church, Grangegorman, and Saint Michan’s, Church Street). The first church on this site was built in 1178, pre-dating the arrival of the Anglo-Normans in the city, and named after Saint Werburgh, Abbess of Ely and patron saint of Chester who died in 699 AD. An earlier church serving this parish stood near the south end of Werburgh Street and was named after Saint Martin of Tours. After Saint Werburgh’s Church was built it was popular with people from Bristol, who were among the earliest settlers in Dublin. It included chapels in honour of the Virgin Mary, Saint Martin and Saint Catherine. The original church was burned down in 1311, along with much of the city, and was rebuilt. From the time of Archbishop Henry de Loundres (died 1228), Saint Werburgh’s was appropriated to the Chancellor of Saint Patrick’s Cathedral. By 1559, the nearby church of Saint Mary del Dam on Dame Street was closed and its parish was incorporated into Saint Werburgh’s, and so Saint Werburgh’s became the parish church of Dublin Castle. Archbishop James Ussher was appointed to this church in 1607, and Edward Wetenhall, later Bishop of Kilmore, author of well-known Greek and Latin Grammars, was curate here. Dean Swift’s friend, Dr Patrick Delany (1685-1768), was the rector in 1730. In the 17th century, there were conflicts over parish boundaries between Saint Werburgh’s parish and the nearby parish of Saint John the Evangelist, in Fishamble Street. At stake was the rates levied by the vestries on local houses in Copper Alley and around Essex Gate and Essex Bridge. A new church was needed by the end of the 17th century, and an act of 1715 provided for building a new church. This was completed by 1719, at a cost of £8,000. However, the new church was damaged by fire in 1754 and it did not re-open until 1759. The present interior dates from this time, and was designed by John Smyth. One of the area’s old fire engines is still stored in the church porch. In the 18th century, Saint Werburgh’s was a fashionable city church. The Lord Lieutenant and his entourage went to church here, and he had his own Viceregal pew inserted in 1767. The tower and spire were added in 1768. In 1787, a commemoration of Handel was performed in Saint Werburgh’s by amateurs of the highest distinction, including Sir Hercules Langrishe, Lord Dillon, Surgeon Neale, Lady Portarlington and Mrs Stopford. The spire overlooked the Castle Yard and it was removed around 1810 as a security measure, and the tower was removed 26 years later. The interior of the church was remodelled in 1877 by the architect William Welland, when the parish was united with the parish of Saint John the Evangelist. The organ still has a space for someone to pump the bellows, a practice that was necessary until the organ was electrified in the 1960s. This space contains a number of historical pieces of graffiti. George Frideric Handel used this instrument for the rehearsal of his work Messiah, which had its premiere in the Great Music Hall, Fishamble Street, beside Christ Church Cathedral. The old churchyard next to the church was used for centuries, and beneath the church are 27 vaults. Lord Edward Fitzgerald, commander-in-chief of the United Irishmen in the 1798 Rising, was buried in the vaults on 5 June 1798, while his captor, Major Sirr, was buried in the churchyard in 1841. The former schoolhouse to the south of the church is being refurbished as the Deanery for Christ Church Cathedral. The Church of Saint Augustine and Saint John the Baptist in Thomas Street is more commonly known as ‘John’s Lane Church.’ This church, to the west of Christ Church Cathedral, is in the heart of the mediaeval city. The church opened in 1874, but has a much longer history, and stands on the site of Saint John’s Hospital, which was founded ca 1180. The original hospital on the site was built by Aelred the Palmer, a Norman living in Dublin, after a safe homecoming from a pilgrimage to Jerusalem and the Holy Land. He founded a monastery of Crossed Friars under the Rule of Saint Augustine. The friars also ran the nearby Hospital of Saint John of Jerusalem. Their monastery was dedicated to Saint John the Baptist and stood outside the city walls, and so was known as Saint John’s Church without Newgate. When Edward Bruce marched on Dublin in 1316, 700 years ago, Saint John’s Church was burned to the ground, along with the surrounding houses. The friary was suppressed at the Dissolution of the Monasteries at the Reformation. In the early 18th century, the Augustinians returned to the site when the Prior rented premises to use as a chapel. This stable on the west side of Saint John’s Tower was a surviving fragment of the Hospital. A small church was built on the site of part of the Hospital in 1740, and it was extended 40 years later. In 1860, the Augustinians decided to build a new church. The project was seen through by Father Martin Crane from Wexford man, and building work began in 1862. The architect was Edward Welby Pugin, son of AWN Pugin (1812-1852), the key figure in the Gothic revival in church architecture in Ireland. EW Pugin was assisted by his Irish partner and brother-in-law, George C Ashlin from Cork. The initial contractor was Michael Meade of Great Brunswick Street (now Pearse Street), who also built the O’Connell Monument and Vault in Glasnevin Cemetery. The remaining ruins of the mediaeval church were demolished, including the remains of the Magdalene Tower from the old church which stood where the high altar stands today. Building work began at Easter 1862, but the church took 33 years to complete. It is aid the foreman and many of the workers were Fenians, and so the church was nicknamed ‘The Fenian Church.’ The spire, designed by William Hague, and roof were completed in 1874, when the church opened. The exterior work was not completed until 1895 and the solemn opening took place on 15 December 1895. The interior was not completed until 1911. The church steeple is the highest in Dublin, standing at over 200 ft (61.0 m). It was originally not designed to hold bells, but a spiral staircase was added later to provide access to bells. The Bell Ringers Company of John’s Lane was formed in 1872 and the bells were first rung on Saint Patrick’s Day 1873. The 12 statues in the niches on the tower are the work of James Pearse, father of the 1916 leader Patrick Pearse. It is worth pointing out at this stage that James Pearse was originally a Unitarian from Birmingham. John’s Lane Church remains an iconic landmark on the Dublin skyline, but we should not see it as a museum. It is a functioning inner-city church today, with daily Masses and confessions, regular weddings, funerals and the usual services of a busy parish church. John’s Lane Church is 50.29 meters long (165 ft) and 28.34 meters wide (93 ft). The nave is 19. 81 meters high (65 ft) and the columns, which were chosen for their strength and slenderness are of Cork red marble. The steeple is the highest in the city by virtue of its geographical location and is 67.97 meters high (223 ft). Its massive bell- tower holds 10 bells weighing almost 6 metric tonnes. The bell-tower has 12 niches for statues. The white carrara marble high altar was sculpted by Edmund Sharpe who also sculpted the shrine to Our Mother of Good Counsel. Among the striking aspects of John’s Lane Church are the pillars, the soaring Gothic arches and the beautiful stained-glass windows, especially the three windows from the studio of Harry Clarke (1889-1931). On the right-hand side going towards the altar the fourth window along is a Harry Clarke. Next to it, just outside the Shrine to Our Lady of Good Counsel, is a beautiful window by Michael Healy (1873-1941) who studied in Florence and who was a contemporary of Harry Clarke. It represents the major events in the life of Saint Augustine, and the rich colours of this window are seen in full splendour on a sunny summer morning. 1, Saint Patrick baptising King Aengus of Munster, with the Rock of Cashel, seat of the Kings of Munster, in the background. 2, Saint Thomas of Villanova, a Spanish Augustinian famous for his love of the poor. 3, Saint Augustine and Saint John the Baptist, joint patrons of the church. 4, Saint Nicholas of Tolentine, an Italian Augustinian famous for his devotion to the souls in Purgatory. 5, Saint Monica receiving the cincture and passing it on to her son, Saint Augustine. John Earley was born to Irish parents in Birmingham, and ran his business from Camden Street. At one time, he was an apprentice at Hardman and Company in Birmingham under the direction of Pugin. There are a further two Harry Clarke studio windows in the church, one at the Shrine of Saint Rita and another immediately following. Harry Clarke’s glass is distinguished by the finesse of his drawing, unusual in this medium, and his use of rich colours which was inspired by an early visit to the Cathedral in Chartres. He was especially fond of deep blues, and he was innovative in his integration of the window leading as part of his overall designs. His work was influenced by both the passing Art Nouveau and the coming Art Deco movements. The Great Window over the entrance, like the apse windows, is the work of Mayers of Munich and is best seen as a complete unit, with two rows of saints. In the upper row are Saints Catherine, William, Clare of Montefalco, Augustine and John the Baptist, Monica, Thomas of Villanova and Rita of Cascia. The lower row depicts Saints Gelasius, Limbonia, Lucy, Nicholas of Tolentine, Juliana, Patrick, Brigid and John the Apostle. The arch overhead is aflutter with angels’ wings. Franz Mayer and Company was founded in 1848 by Joseph Gabriel Mayer. Originally they produced altars and shrines followed by the inclusion of stained-glass design work in 1856. Harry Clarke’s father, Joshua Clarke, was the Irish agent for Mayers. Mayers windows are noted for the detail in the faces of the figures. Their windows can be seen in more than 100 cathedrals world-wide, including Saint Peter’s in Rome. Mayers windows include a rich array of ecclesiastical vocabulary. Saints are often shown with their personal symbols: Saint Peter with keys, Saint Luke as an ox, Saint Mark as a winged lion, Saint John the Evangelist as an eagle, Saint Paul with a sword, and so on. Saint Catherine’s Church is a Roman Catholic inner-city parish church on Meath Street. The church suffered severe damage in an arson attack in January 2012, but has been restored beautifully since then. This is the second church on this site. The first church was an octagonal chapel opened in 1782. The chapel and a presbytery were knocked down to make way for a bigger church. The history of this parish dates back to the 13th century, when a church dedicated to Saint Catherine is mentioned as a chapel of ease of the monastery of Saint Thomas which was founded in 1177. The first post-Reformation Roman Catholic parish priest of Saint Catherine’s, a Father Donnagh, was arrested with many of his parishioners in 1617. For the next 100 years, or so the fortunes of the Roman Catholic clergy and people waxed and waned. In 1630, the Church of Ireland Archbishop of Dublin, Lancelot Bulkeley, gave accounts of a ‘mass house’ over a butcher’s shop in Thomas Street and of a Roman Catholic school in Thomas Street and Pimlico. In 1724, the Roman Catholic parishes of Saint James’s Street and Meath Street were divided for administrative purposes. At that time, Saint Catherine’s Chapel was in Dirty Lane, which is now the top of Bridgefoot Street, and this chapel was extended in 1728. By the mid-19th century, Roman Catholicism had a new -found confidence following the legislation for Catholic Emancipation and a major building programme was spreading throughout Ireland. The foundation stone of the new church was laid on 30 June 1852. The architect was James Joseph McCarthy, but I have argued elsewhere that McCarthy may have used designs that were the work of AWN Pugin. Saint Catherine’s is, for all the world, like a poor man’s version of Saint Giles Church in Cheadle, Staffordshire, which Pugin regarded as his ‘perfect’ work. Saint Catherine’s was designed in the Decorated Gothic style like the ideal English country parish church favoured by AWN Pugin. The original church was funded by the Power family who were intermarried with the Talbot family, Pugin’s own patrons in Staffordshire and Co Wexford, and the craftsmen who worked on it had all been engaged in Pugin’s own works in Ireland. The main church was completed in March 1857, but the original design of the upper portion of the tower and spire were never completed. The church was dedicated to Saint Catherine of Alexandria on 30 June 1858, and was opened by Bishop Whelan of Bombay. The stained glass windows, a new porch and carvings in the nave were added later. The impressive great East Window (1862) is by Frederick Settle Barff (1823-1886), a former Anglican priest who had converted to Roman Catholicism in 1852. The East Window was matched by an equally impressive West Window with perpendicular panelled tracery. James Joyce’s first short story, The Sisters, is about a former priest of Saint Catherine’s Church. The present church tower was completed in 1958 to mark the centenary of the opening of the church. The Augustinian Order has been running the parish since 1974. On 2 January 2012 an arson attack on the church started with a fire in the Christmas crib and caused over €5 million damage to the interior. The restoration and reconstruction project cost €4.1 million. Most of the cost was covered by insurance, with the additional €230,000 needed provided through local fundraising. The church reopened at the end of 2013, when Bishop Eamonn Walsh celebrated the first mass in the restored church. A year later, the altar was consecrated by Archbishop Diarmuid Martin. The beautiful East Window above the High Altar by Frederick Settle Barff (1823-1886) was repaired in Germany. The organ, which everyone thought was completely destroyed, was salvaged; and the Stations of the Cross were removed and restored. The ceiling boards and insulation above the ceiling boards were removed and replaced. The slates on the roof were replaced. All stonework was stripped back to the original stone. The walls and ceilings were cleaned and repainted. The electrical works were replaced, and a complete new lighting system was installed. All the floor tiles were removed and replaced. The altar and all the marble stonework was cleaned and polished. The High Altar is by Henry Lane, and for many years it was believed that this was stucco plasterwork. However, when the layers of paint melted away they revealed that the altar was made of beautiful French limestone, and all the pillars were made of the same stone. The butter-coloured stone from Caen in Normandy is inlaid with gold mosaic tiles. A parquet floor has been fitted to replace mid-20th-century linoleum. The wooden pews have been cleaned, varnished and reupholstered. And the stained glass windows have been restored and they now reflect patches of coloured light around the golden stone. However, the painting in the architrave, separating the chancel from the nave, has not been restored. This painting depicted ‘The Martyrdom of Saint Catherine of Alexandria,’ and was by William MacBride of Dublin. It was in a similar position as the ‘Doom Painting’ in Pugin’s ‘perfect’ Cheadle, near Alton Towers, the Earl of Shrewsbury’s home in mid-Staffordshire. Some of the unusual features in the church that have been retained though include a bust of Kevin Barry masquerading as a saint, which was installed in the early 1920s by a priest with strong nationalist views. 2.2: Ritual and symbol seen through the eyes of secular liturgy and ritual: evaluating experiences, e.g., drug culture, sports, theatre, &c.
(Revd Canon Professor) Patrick Comerford is Lecturer in Anglicanism, Liturgy and Church History, the Church of Ireland Theological Institute. These notes were prepared for a field-trip with Year II MTh students at the start of the start of the module TH8824: Liturgy, Worship and Spirituality, on 29 September 2016. The Chapel, the Church of Ireland Theological Institute. In the name of + the Father, the Son and the Holy Spirit. Amen. There are few references to Saint Michael in the Bible (Daniel 10: 13, 21, 12: 1; Jude 9; Revelation 12: 7-9; see also Revelation 20: 1-3). Yet they have inspired great works in our culture, from Milton’s Paradise Lost to Jacob Epstein’s powerful sculpture at Coventry Cathedral. But culturally, this has been an important day for the Church: the beginning of terms, the end of the harvest season, the settling of accounts. It is the beginning of autumn, we were told as children not to pick blackberries after this day. In all our imagery, in all our poetry, Saint Michael is depicted and seen as crushing or slaying Satan, often Satan as a dragon. Our ideas of dragons are also culturally conditioned. For the Chinese, dragons symbolise gift and blessing, and represent the majesty of the imperial household. In most European languages, the word for a dragon is derived from the same Greek word used for a serpent. In European folklore and mythology, legendary dragons have symbolised danger and evil. We are warned in the Greek classics against sowing dragon’s teeth. Most of us know that throughout life we are going to meet our own dragons, and how they are going to ensnare us if we do not face them and slay them. Because of the Blitz during World War II, the poet Philip Larkin (1922-1985) spent some of his late teen and early adult years living with his father’s family, close to Saint Michael’s Church in Lichfield, where generations of the Larkin family are buried. There, on the north wall of the church, in a large, looming sculpted image, Saint Michael is crushing the dragon under his feet. Memories of this image and this churchyard may have inspired the imagery in at least two poems written by Larkin some years later. In his poem ‘At the chiming of light upon sleep’, first drafted on this day 70 years ago [29 September 1946], Larkin links Michaelmas and a lost paradise with chances and opportunities he failed to take in his youth. In his poem ‘To Failure,’ written a year before he moved to Belfast, Larkin realises that failure does not come ‘dramatically, with dragons / that rear up with my life between their paws.’ Failure comes with more subtlety in those wasted opportunities and lost chances. During your time here, you will have your own dragons to slay. Do not mistake them for old friends. You will have opportunities and chances to do that, as the days pass quicker than you can count, you will find you have neglected or even lost. Know your dragons. You already know your own dragons better than I do or anyone else here. But also pay heed to the opportunities that pass far too quickly. And take the opportunities presented here, like Nathanael waiting beneath the fig tree, to prepare yourself for the next stage in your life and ministry. There may be few dramatic conflicts with your inner dragons while you are here. But in the years to come, you may regret not paying attention to the little opportunities, the minor details of life here. Then you do not notice the changes, the days passing more quickly, and the years pass by. Install you at my elbow like a bore. Sitting under his tree, Nathanael was aware of the opportunities and did not allow them to pass him by. And when you seize these opportunities you may find yourself prepared to ‘see heaven opened and the angels of God ascending and descending upon the Son of Man’ (John 1: 51). That’s seen, some mornings, running down a lawn. (Revd Canon Professor) Patrick Comerford is Lecturer in Anglicanism, Liturgy and Church History, the Church of Ireland Theological Institute. This sermon was preached at the Eucharist on the Feastday of Saint Michael and All Angels, 29 September 2016. Module outline, including schedule for lectures and workshops, module content, learning outcomes, teaching and learning methods, learning outcomes, teaching and learning methods, assessment, essay titles. 1.2: Liturgical Field Trip (1), visit to inner-city churches. 3.2:The use of church buildings in the mission of God expressed through the Church (Seminar with readings from Richard Giles). 4.2: Traditions of prayer (1): seminar readings on Benedictine, Franciscan, prayer. 5.2: Traditions of prayer (2): seminar, readings on Reformation prayer. 6.2: Traditions of prayer (3): seminar, patterns of prayer today (including all-age worship, participation of children in worship, worship and youth). 7.2, Seminar: ‘Word’ and ‘Sacrament’ expressed in music and the arts. * These lectures may need to rescheduled in consultation. 8.2, Seminar: homiletics and homiletics in history: readings may include Saint Augustine, Thomas Cranmer, Lancelot Andrewes, John Wesley, Martin Luther King. 9.1, Baptism and Eucharist (3) the contemporary life and mission of the Church. Worship and inculturation. 9.2, Theology of the whole people of God, the theology and rites of ordination; gender and ministry. 10.2, Seminar: Spirituality of ministry; readings on the minister as person, private, public and holy. 11.1 and 11.2, Seminar: Sacred space and public worship in another context – visit to a public place of worship of another faith. 1, The relationship between doctrines of creation/Trinity and Christian theology of worship and prayer. 2, The development of the liturgical year and the daily office. 3, Different traditions of prayer, e.g. Benedictine, Franciscan, Reformation, contemporary. 4, Patterns of prayer today (including all-age worship, participation of children in worship, worship and youth). 5, The nature and theology of sacraments. 7, The theology and development of rites of Baptism and the Eucharist in the early Church, the Protestant Reformers, liturgical renewal among Catholics and Protestants in the 20th century. 8, Ecumenical statements, e.g., WCC Baptism, Eucharist and Ministry. 9, Baptism and Eucharist in the contemporary life and mission of the Church. Worship and inculturation. 10, Rites of passage, e.g., Marriages, Funerals. 11, The Christian theology of space, and its implications for church buildings. 12, The use of church buildings in relation to the mission of God expressed through the Church. 13, The Ministry of the Word. 14, A critical grasp of the history of homiletics, including close study of examples, e.g. Augustine, Thomas Cranmer, Lancelot Andrewes, John Wesley, Martin Luther King. 15, Patterns and models of homiletics for the context of 21st century Ireland. 16, The ‘Word’ expressed in music and art. 17, The relationship between Word and Sacrament. 18, Theology of the whole people of God, and within that the theology of ordination. 19, How such theology is expressed in rites of ordination, historical and contemporary. 20, The minister as person, private, public and holy. 21, Spirituality for ministry; the practice of spiritual direction, in history and contemporary examples; gender, spirituality and ministry. ● To be able to articulate the way in which liturgies can both reflect and challenge social norms. ● To engage critically with the history of homiletics in the creation and delivery of sermons. ● To display knowledge of the diversity of approaches to spirituality found in the history of the Church; to appreciate the theory and practice of spiritual direction against the background of the history of Christian spirituality; to show awareness of the relationship between different personality types and different paths in Christian spirituality; to demonstrate appreciation of the need for a minister to develop a personal spiritual discipline. This module will be taught through a series of lectures and student-led seminars. Students are required to take part in and lead class seminars and also to take part in collaborative small groups and independent study. There will be a joint seminar with each of the other two strands – Biblical Studies and Theology. Assessment: 2,500 words of coursework (e.g. essay or project as agreed by the course leader). Date for submission: Monday, 19 December 2016, 12 noon. 1, Discuss the principal institution narratives in the New Testament and explain the liturgical problems and insights that may be gained from the narrative of the Last Supper in Saint John’s Gospel. 2, Identify the principal differences between Order I and II for Morning Prayer and Evening Prayer in The Book of Common Prayer (2004), and compare the advantages and disadvantages in using them in a contemporary parish setting on Sundays. Discuss the three Eucharistic Prayers for Holy Communion 2 in The Book of Common Prayer (2004), comparing and contrasting the similarities and differences in emphases. 3, Outline the changes and reforms in Anglican rites of the Holy Communion (Eucharist) at the Reformation, and outline how they were influenced by changes and developments in the Continental Reformations. Trace the background to the development of the Sarum Rite or Use of Sarum and discuss its relevance to the development of The Book of Common Prayer (2004) and Anglican liturgy. 4, Discuss the contribution of either John Keble or Charles Gore to the Anglican understandings of tradition and the sacraments, compare them with those of Charles Simeon, and discuss the relevance of their writings today. Outline and compare the contribution to our understandings of Anglican spirituality made by two of the following writers: Evelyn Underhill, Dorothy Sayers, Cecil Frances Alexander or Elizabeth Canham. 5, Explain the importance of the Eucharistic chapters in the Didache and discuss their relevance for thinking about liturgy in the contemporary church. ‘The Apostolic Fathers and the Desert Fathers provided the inspiration for Christian spirituality throughout the Middle Ages and beyond.’ Discuss their relevance to the Christian tradition of spirituality. 6, Discuss the Service of the Word as outlined in The Book of Common Prayer (2004) and examine the principal opportunities and difficulties it provides in organising a Sunday service in (a) a traditional parish and (b) a new church plant. 7, Baptism has been described as the foundational sacrament of the church. Discuss how you understand the role of baptism in the life of a parish today. Baptism and confirmation are generally used as two separate rites today. Outline the arguments both for and against maintaining the current practice. 8, Explain the opportunities and difficulties in trying to create a sense of ‘sacred space’ in a contemporary or modern building, discuss the liturgical problems that need to be faced, and explain how you would seek to overcome them. Give three examples of what may be described as public or secular liturgies, draw comparisons between your examples and the conduct of liturgy in the Church, and discuss the lessons that can be learned and shared mutually. P. Bradshaw (ed), The New SCM Dictionary of Liturgy and Worship (London: SCM Press, 2nd ed, 2002). S. Burns, SCM Studyguide to Liturgy (London: SCM Press, 2006). M. Earey, G. Myers (eds), Common Worship Today: an illustrated guide to Common Worship today (London: HarperCollins, 2001). R. Giles, Creating uncommon worship (Norwich: Canterbury Press, 2004). R. Giles, Re-pitching the tent (Norwich: Canterbury Press, 3rd edition, 2004). B. Gordon-Taylor and S. Jones, Celebrating the Eucharist, A practical guide (London: SPCK, 2005/2011). C. Hefling, C. Shattuck (eds), The Oxford Guide to the Book of Common Prayer (Oxford: OUP, 2006). G. Hughes, Worship as Meaning: a liturgical theology for late modernity (Cambridge: CUP, 2003). C. Jones, G. Wainwright, E. Yarnold, P. Bradshaw (eds), The Study of Liturgy (London: SPCK, 1992). H. Miller, The Desire of our Soul: a user’s guide to the Book of Common Prayer (Dublin: Columba, 2004). M. Perham, New Handbook of Pastoral Liturgy (London: SPCK, 2000). R. Thompson, SCM Studyguide to the Sacraments (London: SCM Press, 2006). (Revd Canon Professor) Patrick Comerford is Lecturer in Anglicanism and Liturgy, the Church of Ireland Theological Institute. This module outline was prepared for Year II students on the MTh course at the start of the Module TH8824: Liturgy, Worship and Spirituality, on 29 September 2016.